Honda CR-V Performance, Engine, Ride, Handling | What Car? 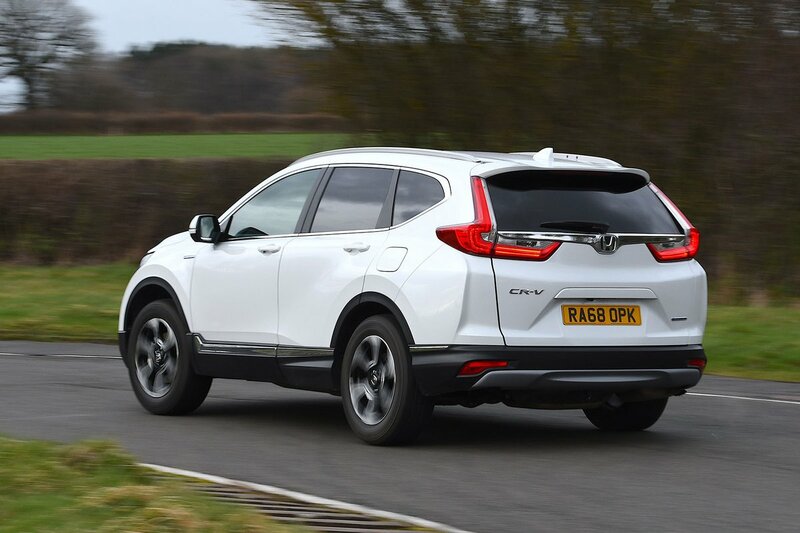 Once upon a time, the CR-V was available with the usual array of petrol and diesel engines, but times have changed. Diesel has disappeared, leaving a 1.5-litre turbocharged petrol engine or a 181bhp hybrid system that combines a 2.0-litre petrol engine and an electric motor. The 1.5-litre gives 171bhp when hooked up to the six-speed manual gearbox or 190bhp if specified with the CVT automatic. The latter variant has a bit more torque, too, which will come in handy if you plan on making frequent use of the seven-seat option. 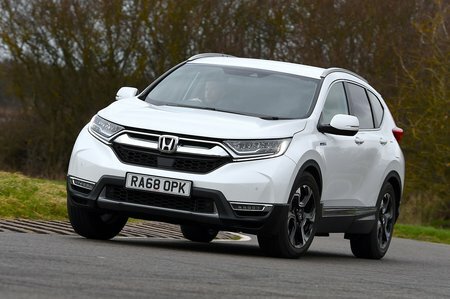 In manual form with front-wheel drive, the 1.5 will take the big CR-V from 0-62mph in 9.3sec, or 9.8sec if you order four-wheel drive. It feels peppy enough, and will pull you along reasonably well, even in fourth and fifth gears, if you keep the revs above 2000rpm. It continues to build speed progressively between 3000rpm and its limiter, and roughly matches the pace of a Skoda Kodiaq fitted with a similar-sized petrol engine, but there are plenty of quicker rivals on the market. It's worth bearing in mind that diesel rivals, may feel rather more at ease on hills when heavily laden. If you opt for the CVT automatic, not only do you get four-wheel drive, but also more torque and more power. There's not quite enough to match the rival diesels, but it does make the CR-V more drivable and relaxing, even though it's slightly slower on paper. The hybrid has even more torque than the petrol, and copes better when heavily laden. 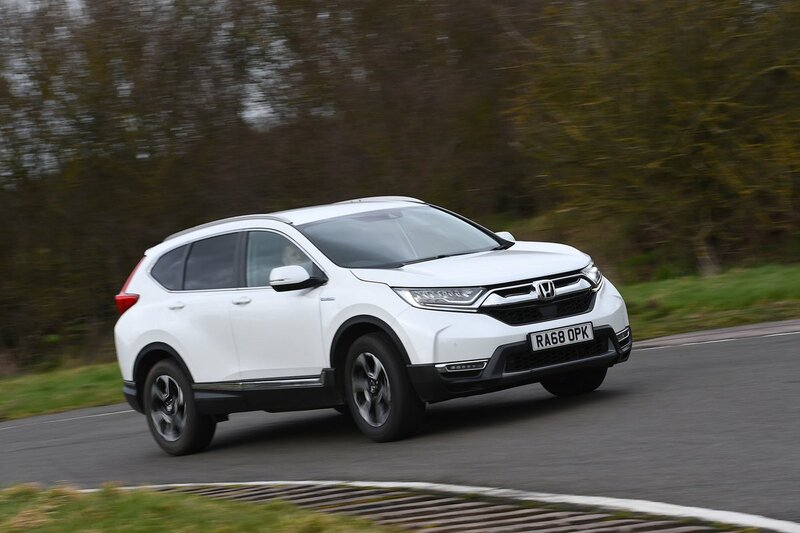 The two-wheel-drive model is the quickest in the CR-V range, getting from 0-62mph in 8.8sec (9.2sec on the four-wheel-drive version), and is our favourite engine for the CR-V. There’s adequate performance to keep it cruising at motorway speeds, and is smooth and works well with the CVT gearbox. Bear in mind, though, that the Toyota RAV4 Hybrid offers a bit more poke. Don’t expect the CR-V hybrid to tow very much either: while the manual CR-V can pull a braked trailer of up to 2000kg, the hybrid can only manage 750kg. To put that into context, the four-wheel-drive RAV4 Hybrid can tow up to 1650kg, and shouldn’t struggle with a sizeable caravan. If you're looking to cruise in comfort, the CR-V is a sound choice. It's suspension set-up is on the soft side and is effortlessly compliant over most surfaces: it passes over even the most vicious crags without sending a crash through the bodywork, takes speed bumps in its stride and feels much calmer than stiffer rivals, such as the Mazda CX-5, on a long motorway journey. It doesn't quite match the pillowy comfort offered by a Citroën C5 Aircross but, as an upside, the CR-V feels better tied down over undulations and it's less likely to trouble passengers prone to bouts of travel-sickness. This class has ‘large’ in the title – an adjective not normally associated with nimble things. Yet while SUVs don’t generally handle as well as low-riding cars, there are some tidy-handling offerings around, most notably the Mazda CX-5, but also the 5008 and Tiguan. The CR-V, though, isn’t in that company. It's not as wallowy as a Citroën C5 Aircross, but where a CX-5 feels comparatively eager to tuck in to turns, the CR-V's conspicuous body lean highlights how much less keen it is change direction. The hybrid version is even less up for quick changes of tack, because the additional weight of its batteries exacerbates such body movements. It’s grounded enough that you don't feel in constant danger of leaving the road, though, while the added grip from the four-wheel-drive models gives an extra bit of confidence in slipper conditions. The steering, while initially slower from a start than the sportier CX-5's, has a decent weight to it. Its rate of response improves the more lock you apply, getting quicker as well as heftier so you're always able to accurately position the CR-V on the road. Rev the 1.5-litre petrol engine hard and it sounds like a dog that’s had its tail trodden on; it barks like a sports car but is also whiny and coarse at certain points in the rev range. Driven less vigorously, though, the noise settles down. The extra power and torque you get in the automatic model help to prevent a common trait of CVT gearboxes: that annoying tendency for the engine revs to soar unnecessarily. In the CR-V, the engine rarely draws attention to itself quite so acutely. Quieter still is the hybrid version, which can run for periods of time in pure electric mode with the engine switched off altogether. However, since the electric-only range is less than three miles, respite from engine drone is brief, with the silence interrupted by that unmistakable electric motor whine when getting back up to speed. Of course, you can control the revs more easily with the manual gearbox, but although the action is precise, it’s notchy and feels a little heavy. The clutch pedal has a lovely natural movement, though, and the brakes on all models are strong and progressive. Sadly, road noise is prominent, even at moderate speeds, and wind noise increases when you hit the motorway.